I hope you’re ready for the onslaught of recipes this month. After hibernating the past couple of months, I am armed with an arsenal of recipes, one recipe from each of the Indian states. I along with 28 wonderfully talented bloggers of the blogging marathon group have been preparing for months now for this mega marathon. I really hope you guys have fun discovering new dishes from different corners of India. 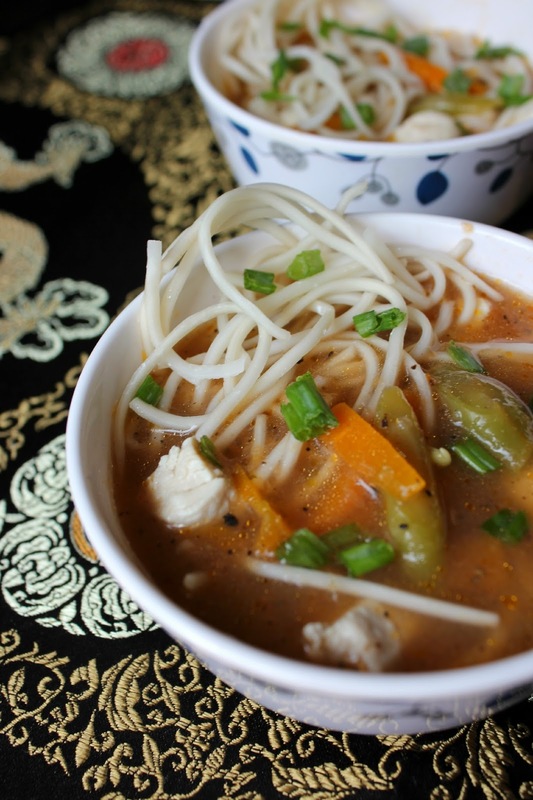 Today the state in the spotlight is Arunachal Pradesh and I’ve made the very famous Himalayan noodle soup – Thukpa. Arunachal Pradesh is the scenic state at the north eastern tip of India. The people and cuisine of the state share plenty with the Tibetan-Burman neighbours by way of their roots and recipes. 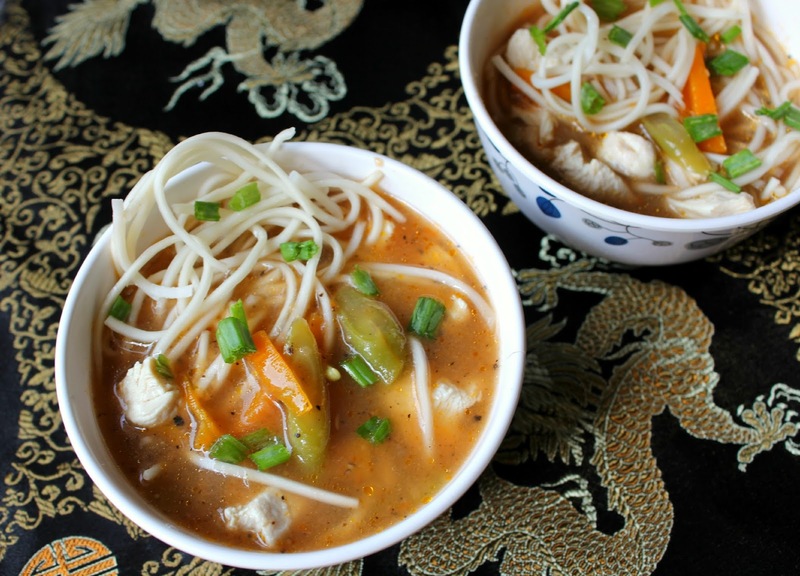 The Thukpa – a hot, spicy noodle soup is filled with the goodness of vegetables and it’s perfect for winter, for cold climes. But living in Chennai, I cannot wait for that to make Thukpa. I’ll never get to make Thukpa. It’s a different thing that Jagan makes up for it by turning the AC full blast and unable to cope with the extreme cold I sport extra T-shirts (looking like a nut as usual). You’ll likely see a quite a lot of Thukpas today among my blogging marathon friends too. I picked up this Thukpa recipe from here. I liked this version because it had an interesting spice paste that is cooked before adding in the vegetable stock. I made it a chicken Thukpa because that’s the only way I can sell it at home. But you can quite easily switch the chicken for tofu or paneer and make it a vegetable Thukpa. It’s light, flavourful and tasty. 1. Cook noodles as per packet instructions, rinse in cold water, drain and set aside. 2. Grind together the ingredients under spice paste to a smooth paste. 3. Heat butter in a pan. When melted, add the spice paste and fry for a couple of minutes or till the raw smell disappears. 4. Pour in the vegetable stock or water. Add the chopped carrots and green beans and simmer till the vegetables are tender. Season with salt and black pepper powder. 5. Divide the chicken (or paneer or tofu) and noodles among 4 bowls. Ladle the soup into the bowls. Garnish with chopped spring onions. Serve hot. 1. To cook chicken, boil 1 cup water. Season with salt and pepper. Throw in raw chicken pieces and boil for 15 minutes or till chicken is cooked through. Remove chicken from the stock, shred and use. You can use the stock in the soup too. 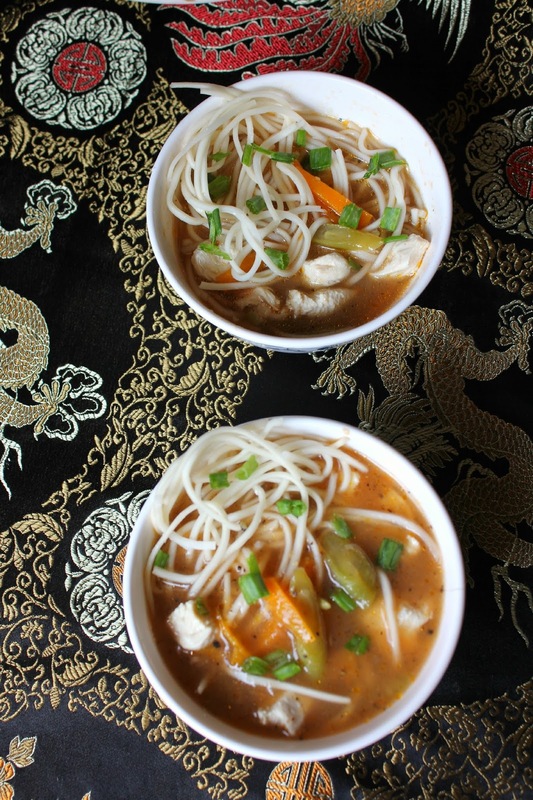 This entry was posted in Soups and tagged arunachal Pradesh cuisine, arunachal Pradesh recipe, Blogging Marathon, chicken thukpa, himalayan noodle soup, hot spicy noodle soup, recipe, soup, thukpa, vegetable thukpa. It's surely raining Thupka..the pictures have come out very well Jayanthi..very nice..
Its looks like thupka day for Mega marathon, well done Jayanthi. Thupka everywhere!!! all versions are so beautifully made!!! love the first click.. Very well captured,love the first click a lot..thukpa has come out so delicious.. It sure is raining Thukpas in the blogosphere today. I made the same dish too. very delicious thukpa and so very well captured 🙂 looks very inviting dear !! Comforting and inviting soup dear!! looks great..
Sure it was a thukpa day. Love your spicy version. Thupka looks so comforting and delicious!